Beat The Winter Doldrums: Fun At The Chutes! Fundraising is not an easy job. Ask anyone that’s had to do it for a living, and they’ll be the first to tell you that it’s not for the faint of heart. It requires a special skill set that not all of us were blessed with. Sure, you have to be passionate about your mission, organized, flexible, and willing to put in the long hours to achieve your goal, but you also have that intangible ‘IT’ factor that not everyone has – you have to be creative. Getting people to hand over their hard-earned money to something that they may not directly benefit from is both an art and a science. There are amazing causes everywhere you look. There will never be a shortage of needs that have to be met in this broken world. Thus, the reality is, everyone is asking for money. And we are all competing for those same dollars. So in order to be successful in this line of work, you have to be willing to think outside of that fundraising box. You have to engage and inspire the people so they may first know about your cause, and then feel compelled to support it. We just got through December – which just so happens to be the best month for giving. Money leaves our hands easier in December. But once the calendar year flips, the grip tightens. But that hasn’t stopped the good folks at Crowders Ridge Camp and Retreat Center. They’ve been hard at work fundraising since Thanksgiving, and will continue to do so through February 19. But they’re not organizing a winter 5K at the campsite or selling scores and scores of BBQ plates to friends and neighbors. They aren’t even badgering you to buy a 50/50 raffle ticket. They thought outside of the fundraising box and have found an idea that has gained some traction, which is ironic, since the whole idea is built around the absence of traction. 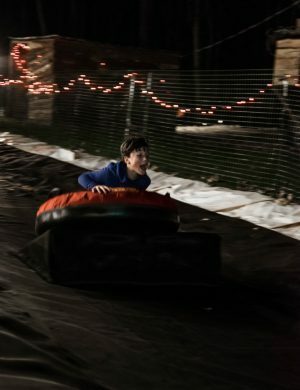 Jay Oliver, the founder and executive director of Crowders Ridge Camp and Retreat Center, has taken the whole snow tubing phenomenon and has turned it on its head. This idea was borne out of a long, expensive snow tubing trip to the mountains with his family a few years ago. Some ideas sound great in our mind. However, upon execution, it didn’t end up quite how he had envisioned it. It was way too cold and no one had any fun. 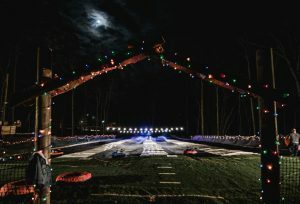 So Jay and his team created Chutes – a type of snowless tubing for people of all ages. And even better yet, you don’t have to drive all the way to the mountains to experience the thrill. I’ve been twice now and I’m not even a thrillseeker. However, there’s something invigorating about hopping on a tube at night and letting gravity take over. Gravity took over in more ways that one. I had so much fun the first time, I had to hand over my money again and experience it a second time. I know it sounds cheesy, but that’s truly putting the fun into FUNdrasing. And as a result, this fundraiser will help them turn it into a “BARNraiser”. Crowders Ridge is a camp and retreat center for students and youth. That’s their primary focus. 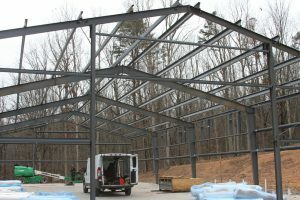 However, they are in the middle of a capital campaign to build a climate-controlled building on-site that can be used year-round as a dedicated worship space. Monies raised through the Chutes will also provide scholarship opportunities to those summer campers who may need some financial assistance. They’ve been Gaston County’s best kept secret for a couple of years…until now. The Chutes have attracted people and families from all over the Charlotte metro area. They say, ‘If you build it they will come’. Only instead of turning an old corn field into a baseball field, Crowders Ridge has taken a nothing-happening sloped wooded area and has turned it into an amazing tubing experience. And as a result, they did come- in droves. Sure, they came to tube first and foremost. But you can’t go there and not wonder how you never heard of this place before. Awareness is everything when it comes to fundraising. And thanks to the Chutes, they have people taking notice. But the tubing will come and go. And before long, it will make way for spring retreats and summer campers. In the meantime, don’t let the winter doldrums get you down. The Chutes are still going on through February 19. Put down those electronic devices and pick up a tube. And let gravity take you (and your money) away.